- Quite a few traveller joints such as Brown Bread Bakery, Open Hand cafe, and Aum Cafe. Brown Bread and Aum are highly affordable whereas Open Hand is a little expensive if you are on a shoestring budget. - Don't miss the early morning boat ride. Haggle for price though. - Everything is accessible as its not such a huge city. Most of the popular places can be walked to or you can take a rickshaw. - Beware of touts trying to sell drugs and other such illicit goods. The large number of foreigners have led them to believe everybody wants to smoke a joint or two. Don't indulge in any such activity. - Haggle. From boat rides to rickshaw, never settle for the price quoted by them. Settle for nothing more 50-60% of the actual price quoted. - Keep your valuables safe and no matter how convincing does anybody sound never entrust your valued possessions to anybody. - If you are not used to Indian summers and monsoon then avoid the months of March - August. Varanasi, also known as Banaras, Kashi, the land of Gods, was my last stop in the 6-month itinerary I had planned. As a frequent traveller, I do not have the liberty to comply with the weather forecasts and so, there I was in Varanasi which was scorching with heat at 37 degrees and I thought, in fact almost slapped myself in my imagination, and said “What the hell were you thinking you stupid, stupid girl? Varanasi? During summers? That too after enjoying Darjeeling’s amazing 6 degree (a story for another day)? You should have stayed back home, in your AC room, eating mom-made food, drinking lemonade, watching TLC, and reading the latest Bill Bryson book”. Now my Lonely Planet told me about this particular person, Mr. Uma Shankar, who is in charge of the tourist information center at Varanasi Junction Railway Station. So, all exhausted and mad at my self, I decide to walk up to him and ask him if I can find something decent nearby for a day, as I planned to look around and move to a different hotel/hostel the next day. He smiles, gives me a glass of water (cold water, God Bless you for it Mr. Shankar), pulls out a brochure from the many kept on his table, marks a few places, and then hands it over to me. I look at him – blank of course. He smiles again, introduces himself, and gives me a brief about the places he marked. Surprisingly, he says that he has marked all the off-beaten places in Varanasi because I didn’t look like the normal tourist type (true! ), and that he assumes I would want to stay away from tourist/commercial spots (true again!). He also gives me the address of a nearby backpacker hotel and assures me that I would not have to look any further for accommodation. Almost as if trusting his gut instinct and his level of confidence, I headed towards the backpacker hostel/guest house he had mentioned – Baba Lolark P.G. at Ganges (you can look it up on websites such as make my trip), and it only costs around 300-400INR per day for a private room with double bed and basic amenities, and the guys there were really great. They even got me medicines when I wasn’t well and offered to call the doctor! I have a thing about sunrise and sunsets. Wherever I go, I have to capture 1 sunset and 1 sunrise (at the very least). So, as true to my nature or fetish or whatever it is, I decided to take an early morning boat ride over River Ganges in Varanasi to see the sunrise. I did see the sunrise but there were so many other things that I saw and experienced which I am sure have changed my outlook towards life even more (for better). The same morning I ate breakfast at the Aum Cafe. Run by an American lady, Shivani Aum Datri, who has been visiting India for almost two decades, this place is just the best spot for if you are looking for some peaceful moments. The rooftop restaurant serves a diverse menu of organic and vegetarian dishes. On the ground floor, there is a gift shop where you might find Shivani herself – a very polite and cheerful person I must say! 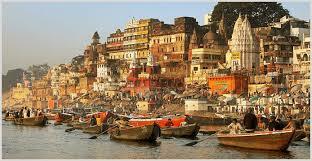 Varanasi, it is believed, has its name from two of its Ghats – Varna and Assi. Assi is the main Ghat though. In between these two Ghats, there are many others. 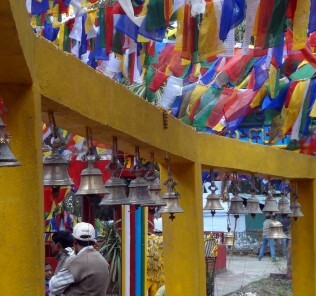 And, every Ghat has a distinctive significance. One is only for Jains, another only for South Indians, one where no one bathes as it is considered to have been cursed by some Hindu deity, one where every evening there is an evening Aarti (prayer) ceremony, and then there was Manikarnika Ghat – the cremation Ghat of Varanasi. As my boat passed through the Ghat and the Sculler narrated stories about Varanasi, I caught a glimpse of a cremation ceremony being performed at the Ghat. We Hindus believe that being cremated in Varanasi brings salvation, and maybe it does (at least that’s how I felt at the time). Dashaswmedha Ghat, the one where every evening an elaborate Aarti ceremony takes place is a must-visit during your stay in Varanasi. Thousands of devotees gathered around the area some sitting on the stairs and on chairs surrounding the prayer area, some standing, and some more thousands squatting in the boats gathered by the banks of the river – all there for only one purpose – to catch a glimpse of this spectacular ceremony! Next, I headed to one of the most popular Traveller joints in Varanasi – The Brown Bread Bakery. I would agree at first it was a little difficult to locate as there is another shop by the same name close by. But, if you want to find the original one you can head towards another iconic landmark – Vishwanath Temple and just keep asking the directions from there or keep walking straight. Alternatively, walk by the riverbanks and after crossing Dashaswmedha Ghat, and Man Mandir Ghat, take the stairs at Meer Ghat to go inside the city and then again just keep asking the directions. There is another famous food joint of Varanasi nearby – the Blue Lassi. I didn’t have a chance to go there but from what I hear, it has over 70 different varieties of Lassi (a cold drink made of yogurt). But, one of the most interesting parts of my travel to Varanasi was the group of travellers I often came across during the evening walk on the river banks. A bunch of 10-15, all from different countries and nationalities, united by one common factor – music! There was a guy on the flute, a girl drumming a plate and bottle, a couple with their guitars, and tens of others just sitting around drinking tea from the local vendor but lost in the soulful sound of music engulfing the skies hovering River Ganga. This everyday encounter finally led me to promise myself a couple of months committed to this city whenever I shall find time next or whenever I shall look for peace within. Well! This, sort of, wraps up my time in Varanasi because the next 4 days were spent inside the hotel room beating the heat and recovering from the health issues! Aditi is a full-time freelance writer and travel blogger who is as passionate about life as she is about travelling. An Indian by birth, she started her solo travel ventures in 2013 at the age of 27 and since then has been exploring various parts of her country and its diverse culture and people. She is a bibliophile and a movie buff and enjoys all things travel! She blogs about her own travel stories on her website - My Dream Travels, and hopes to visit every single country and have one friend at the very least in each country she visits. The easiest way to please her will be to take her to a seafood joint and mention travel.